ROYAL OAK — If anybody’s going to celebrate the late David Bowie, this was the right crew to do it. The Celebrating David Bowie tour on Monday night, Feb. 19, at the Royal Oak Music Theatre featured a full five alumni from Bowie’s bands — including bassist Carmine Rojas and guitarists Earl Slick (and his multiple sunglasses), Gerry Leonard and Mark Plati — and three singers who, knowing full well there’s no replacing the rock icon, did a more than capable job of singing his songs, 23 of them over a two hours and 15 minutes. “It’s been two years (since Bowie’s death) and it’s hard to still not shed a tear,” longtime Bowie keyboardist and tour organizer Mike Garson told the Royal Oak crowd. But rest assured the smiles were in the majority, exponentially. And with good reason. Monday’s show had its share of Bowie’s big hits — including “Rebel, Rebel,” “Fame,””Changes,” “Space Oddity” and “Ziggy Stardust,” the latter three nailed with goosebump-inducing accuracy by Joe Sumner, Sting’s son — but it mostly erred on the side of the aficionado, digging deep into the late icon’s catalog for material Bowie himself seldom, if ever, played. With Garson combining insightful storytelling and Paul Shaffer-like cheerleading, the nine-member troupe created one special moment after another — perhaps none moreso than “Panic In Detroit,” worked up especially for the local show and delivered with powerhouse passion by Gabby Moreno. Bernard Fowler, the Rolling Stones backup singer who sang the bulk of the material on Monday, scored with a soulful “Win,” then combined with Moreno for a show-stopping duet on “Wild Is The Wind.” Garson recalled the in-studio evolution of “Aladdin Sane (1913-1938-197? )” before he and Leonard delivered its avant solos, the pianist quoting both George Gershwin and the Champs (“Tequila”) during his portions in the middle and at the end of the song. 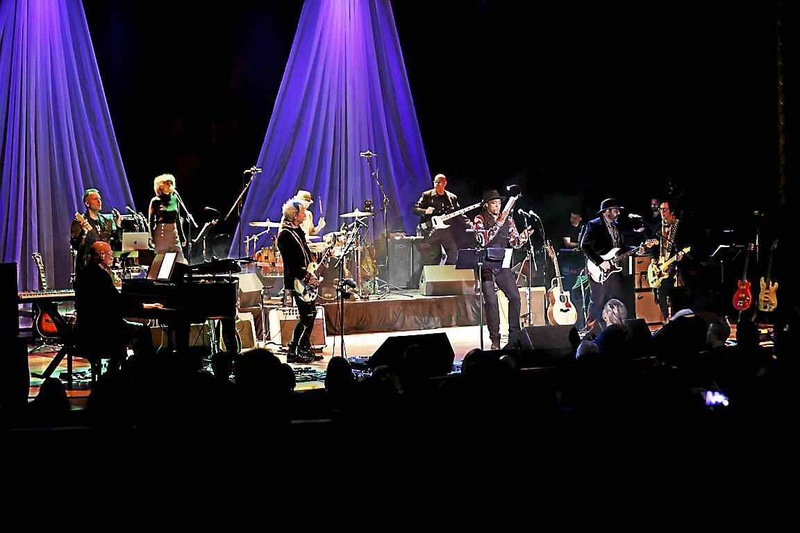 Leonard started the encores with a solo rendition of “Andy Warhol,” using looping devices to layer his guitar attack, while other rarities such as “Drive-In Saturday,” “Lady Grinning Soul” and a powerful “Five Years” received rapturous responses from a crowd of exuberant Bowie devotees. There were other selections from Bowie’s A-list during the night, including “Rebel, Rebel,” “All The Young Dudes,” “Diamond Dogs” and the show-closing “Heroes” — though, curiously, only one post-1977 song (the eerily prophetic opener “Bring Me The Disco King”), leaving a lot of favorites on the bench. That, of course, leaves room for more next time around — and Monday’s fans, at least, would clearly welcome a return visit.